LATEST NEWS: Who almost signed for Sheffield United? Who nearly joined Leeds? Who has turned down Lincoln? Who do Woking want? Michael Bostwick (yellow) was the subject of a bid from Sheffield United. 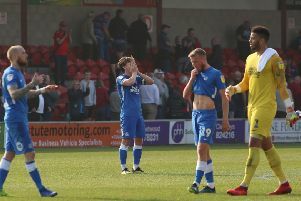 Director of football Barry Fry hasn’t ruled out Michael Bostwick and Marcus Maddison turning out in Peterborough United colours next season. The pair were both placed on the transfer list yesterday (May 2). Both are entering the final year of their contract and in those circumstances club policy dictates players will be made available if a fresh deal isn’t struck. Four clubs are chasing Posh midfielder Jordan Nicholson. Fry admits Posh are ‘testing the market’ with Bostwick and Maddison. He revealed Posh turned down a bid from Sheffield United for Bostwick last season. “Michael Bostwick has been a great servant for Posh,” Fry said. “We did turn down a bid from Sheffield United last season because we still had hopes of winning promotion ourselves. “We haven’t spoken about a new deal with Michael so we are testing the market with him. If nothing develops we will sit down with him in the summer and see what we can sort out. Marcus Maddison might still be a Posh player next season. Strikers Lee Angol and Luke James, full-backs Jerome Binnom-Williams and Hayden White, and midfielder Jordan Nicholson are also entering the final year of their contracts and have been transfer listed. Central defender Jack Baldwin and midfielder Jermaine Anderson are also about to start the final year of their existing deals, but they are expected to sign extensions so have not been listed. Right-back Michael Smith, midfielders Brad Inman and Adil Nabi and striker Shaquile Coulthirst have also been told to find another club. White and Coulthirst spent the second half of last season on loan at Mansfield in League Two. Nicholson has scored 19 goals on loan at National North side Nuneaton. Inman only signed from Crewe last summer. Smith has been a Posh stalwart since his arrival from Bristol Rovers in the summer of 2014. If Smith and White depart Posh will have no specialist right back in their squad. Adil Nabi (left) is on the Posh transfer list. Fry added: “We have accepted a bid for Angol from Lincoln, but he doesn’t want to go there. He thinks he can play higher. We have had four bids for Jordan Nicholson and for Jerome Binnom-Williams so hopefully something will develop there. Woking and Maidstone from the National League and two League Two clubs are after Jordan. “Our manager has been disappointed with Michael Smith after making him club captain, while Brad Inman wants first-team football and he’s unlikely to get it here. “Mansfield manager Steve Evans fancies White, but his chairman doesn’t want to pay for him. We have another League Two chasing Shaquile. Posh are understood to have won the race to sign Dover striker Ricky Miller, but public confirmation has been delayed for reasons to do with the 28 year-old’s contract with the National League side.